There is subtle and not-so-subtle humour at work here. The title can be translated as The Magnets, but remove one letter and Les Amants becomes, in English, The Lovers. 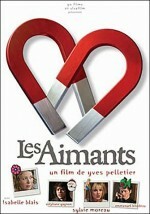 The “official” English title is Love Magnets. So… what’s going on here? The film, which marks the feature debut for actor Yves Pelletier, finds one of the main characters, Julie, back in Montréal after spending some five years in Guatemala. Needing a place to live she moves in with her elder sister, Jeanne. Jeanne is a chronic liar and woman of somewhat loose sexual morals. More important to the story she has become disillusioned with love but is engaged to Noël. Living a not very typical modern life, the two of them maintain very separate existences and only communicate by leaving each other messages posted on the fridge door. For Jeanne the arrival of her younger sister seems to be the answer to everything. She compels Julie to take up with Noël because she wants, maybe needs to have a fling with a passionate musician. Noël, meanwhile, is looking for ways to end his relationship with Hélène, a married woman who is madly in love with him. Without Jeanne’s knowledge he sets Julie up with Michel. Julie adds her own set of complications when, egged on by her friend Marie-Ève, she alters the contents of the messages on the fridge in an attempt to breathe new life into Jeanne and Noël’s relationship. Along the way, she also begins to fall for the seductive Michel. The tables are turned on everyone. In the game of love and truth, illusion leads to betrayal, but love conquers all.